As a rule, there is not much of special interest to report about life in camp. Yes, there was judo and football and baseball to occupy some of the inmates. But fishing? When I heard about how some adventurous men and boys ventured beyond the barbed wire to go fishing, my curiosity was aroused. 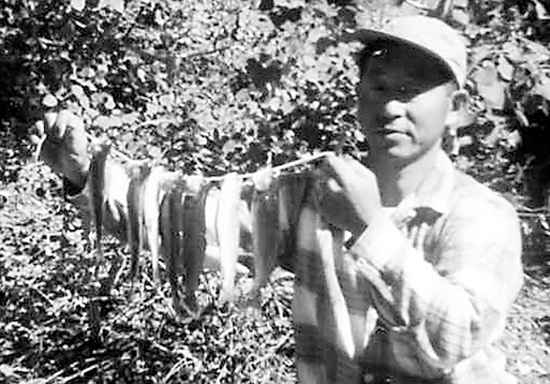 Manzanar internee Shim Nakamura holds a string of trout. As you may know, many of the inmates at Manzanar skipped the temporary “assembly centers” like the Santa Anita Racetrack or Pomona Fairgrounds. Many went by train, but some even drove their cars to get to Manzanar. Possibly due to its northern location, most of the folks living in the San Fernando Valley were incarcerated at Manzanar. Now that I think about it, since they came as a group from the Valley, they tended to return there after the war. Being together for this length of time, I think, played a part in their willingness to sacrifice for the sake of establishing a community center in the Valley. But, back to the Fishing Club film. You may already know the story of how the fishermen sneaked out at night to go fishing in the streams close to Manzanar. What I found interesting was how the film came to be made. Mas Okui was a social studies teacher who retired a few years ago from Canoga Park High in the Valley. Prior to that, he taught at Gardena High. Two Sansei, Cory Shiozaki and Richard Imamura, were students there. Cory came to work as a fishing guide in the Sierras. While working there, he wondered why so many of the people making use of his services were JAs. In questioning them, he discovered their fishing experience had started either as a parent or child during their Manzanar internment. Cory and Richard went into filmmaking and decided to do the Manzanar film: Cory as director, and Richard as screenwriter. This happened about six years ago. According to a recent Rafu Shimpo article, the film is based on 70 hours of interviews with 26 surviving internees or their descendents. 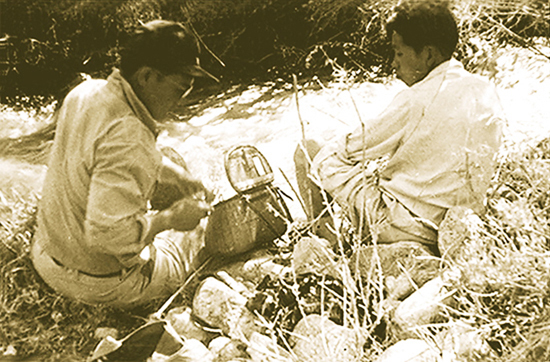 Amos Hashimoto and Archie Miyatake set up their fishing gear at a nearby stream. Producers of the film: Shiozaki, Imamura, Lester Chung, and John Gengl. The executive producer is Alan Sutton, whose younger brother was in Mas’ class. Alan retired, after 25 years, as vice president at Universal Studios. I have another reason to be interested in the film: A friend of mine, Bob Kobata, says about three years ago, he stopped by the Manzanar Visitors Center on Highway 395. There he met Cory, who showed him a number of pictures with Manzanar fishermen. Bob was surprised to see pictures of his dad, which were unidentified. Bob spent ages 5-8 in Manzanar. He is one of the people interviewed in the film, and his father’s picture, shown with a nice catch of trout, appears in the article I mentioned above. I have been on a bus when Mas shared his extensive knowledge, not only of Manzanar, but the various points of historical interest from the Valley clear up to Manzanar. He is active in a fly-fishing club in the Valley, and says he thinks the members consider him “dean” of the club. According to someone whose opinion I respect, “Manzanar Fishing Club” is a first-rate production covering aspects of life in Manzanar as well as offering an entertaining portrayal of the extracurricular fishing. You may Google a preview of “Manzanar Fishing Club.” Also, Sets Tomita, who appears in the film, told me Ken Burns, in filming his series on the national parks, covered the subject. Google: Ken Burns-Manzanar. “Manzanar Fishing Club”will be showing from March 30-April 5 at the Laemmle Theatre in Santa Monica, 1332 2nd St. Admission is $11, or $6 for groups of 25 or more. Seniors, $8.